The saga of the split-tailed mermaids continues — first with Starbucks' old logo and then with Starbucks' new logo, which happens to be the same as the old logo. Now the whorish fishwomen seem to have invaded the pseudo-old timey cartoons of the Trader Joe's Fearless Flyer. Spencer gets credit for the flyer and the highlighting, but Dina gets credit for updating me as to the Starbuck's matter, which, as is to be expected, has drawn the ire of Christian conservatives in San Diego. Personally, I'm glad. Because if Christianity is clearly against anything, it's surely mermaid breasts. Ah, thanks. Yes, it's a good site. I linked to it in what has become the first of three small articles on Baubo sirens and their implied sluttiness. 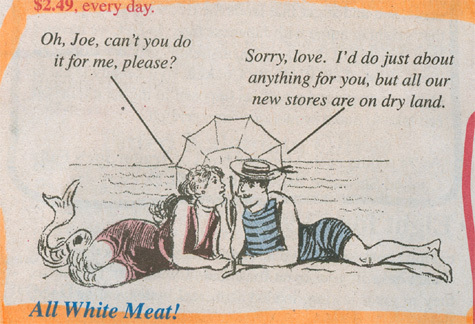 Is that "all white meat" text in reference to the mermaid herself? Or just her split tail?